09-09-2018Pastor's LetterFr. Don Kline, V.F. I pray your summer was blessed and you have had a chance for some fun with family and/or friends. I find that a little rest and relaxation can really help a person to see the world and others in a better light. I want to kick off our new fiscal year with some updates on the state of our parish and our preschool. As we continue to make Christ the center of our parish and the center of our hearts, we trust that we are being faithful followers of Our Lord Jesus. Our success in not measured as the world finds success. Our success is found by spreading the Good News of Jesus Christ and remaining faithful to Him. It is fair to say that many folks at SJA are sharing the love of God and many parishioners are seeking to be intentional disciples. We have 1,879 registered parish families that call Saint Joan of Arc home. In 2017, we registered a total of 233 new families to the parish; already by July of this year, we have grown by 157 families which means year after year, we continue to see an increase of registered families. Our preschool enrollment is around 35 students. As we grow, I am grateful to all who embrace their role as members of this parish and continue to be generous stewards of God’s gifts. Please remember that we have many great ideas for new events and programs, so your participation is vital to the success of our parish. We also have some great ministries for you to join. There is something for every parishioner of St. Joan of Arc parish. Each one of you is important and necessary to fulfill Our Lord’s mission! Adoration of the Most Blessed Sacrament has changed hearts and minds. The impact on individuals and our parish community is beyond measure. With over 500 registered Adorers of Our Eucharistic King, the graces received and prayers offered and answered can only be seen as an incredible blessing for all of us. God always provides in ways we least expect. Who would have ever thought that St. Joan of Arc would be so blessed to have Perpetual Adoration in 2018? To those who don’t have faith, no explanation will do. To those who have faith, no explanation is necessary. Way to go Adorers of Our Lord Jesus in the Most Blessed Sacrament! In terms of catechesis and evangelization, we have Catechesis of the Good Shepherd at St. Joan of Arc! This program is built on the foundation of the Bible and Liturgy and the curriculum follows the Liturgical Cycle of the church year, focusing on the great feasts of Christmas, Easter, and Pentecost. The mysteries of God found within Scripture are embraced, not explained. The Bible is not “taught” but encountered and explored together by the catechist and the child. I encourage you all to visit the parish website for more details about this program that starts in September. This program will have classes available to both parish and preschool children. For children in grades 2-5 we offer Religious Education on Monday, Tuesday, and Wednesday evenings, preparing kids for First Confession/Confirmation and First Communion. Our R.E. meet the same time each week and is also geared for youth in grades 6-8 who are in need of their sacraments or to further their relationship with Our Lord. Teens, please don’t miss out on our youth group which meets Monday evenings following the 6pm Mass! All these groups begin their new year in early September. We would not be able to function without our beloved volunteers. From answering the phones, to stuffing the bulletin, to bringing Our Lord in Holy Communion to the sick and home bound, to serving at Mass, you make it happen. We recently formed our new Parish Council for 2018/2019 with five very enthusiastic parishioners. Our Finance Council is a strong group of money wizards who make sure we are being the best stewards we can be with your generous contributions. Thank you all who have served on these councils in the past. We are better because of you! As most of you have heard, the bishop has allowed our Parochial Vicar, Father Daniel Cruz to remain another year. Fr. Daniel has been a real blessing to our parish community. His genuine positive attitude and love for Our Lord and Our Lady is a great inspiration to me personally and I know touches many hearts. I am grateful to Fr. Daniel for everything he offers St. Joan of Arc. God continues to bless our parish with a wonderful staff who are eager to serve you. They offer their lives as servants who are faithful to Holy Mother Church and serve with hearts after the Most Sacred Heart of Our Lord. We are always looking to serve and for ways to improve our service to the wonderful people of SJA. Please don’t hesitate to reach out to our incredible staff to find out how we can serve you. We are currently changing to a new parish IT system. This system enables us to manage parishioner records more effectively, evaluate how parish resources are utilized (including facilities), and it syncs with our e-Giving platform for even more effective financial planning. I want to encourage everyone who is able to consider online E-Giving. Not only can you use E-Giving to set up auto-tithe weekly or to make one-time gifts but you can contribute to recurring and special collections as well. You can also register as a parishioner on our informative website at stjoanofarc.com. In September, we will celebrate the 5th anniversary of our very own St. Joan of Arc “Santa Maria” Gifts and Book Store. Stop by and see the store’s new layout that Lisa and her team completed over the summer! And, to take us even further into the future, we recently upgraded the computer system to be more customer and store-management friendly. I want to thank our parishioners who are participating in the Together Let us Go Forth Campaign. Approximately 364 families pledged either a financial gift and/or the gift of prayer to this important campaign. Thus far, the diocese has received $545,586 against our $1,482,269 parish goal. Our parish will receive 35% of whatever is collected by the diocese from our parish. Your generosity to the Together Let Us Go Forth Campaign has enabled us to move forward with several necessary projects. The roof repairs are complete, which means no more leaks and no more buckets and towels on the floor! The cost of the new roofing came to nearly $145,000. The painting and repairs for the entire exterior of our campus look amazing. The paint/stucco repairs cost about $66,000. We hope to begin renovation of Santa Maria Hall kitchen very soon. All of this happened after our much needed new parking lot was installed and paid for, making our church grounds even more beautiful and hospitable. I am grateful to the team of St. Joan of Arc parishioners who have helped to not only plan the projects but also helped with the fund raising that was necessary to finance the projects. As I have presented improvement plans and the importance of financial support over the past few months, some generous parishioners were happy to support these projects. If you have not contributed yet, you still have a chance to participate. It is my hope that every St. Joan of Arc family will make a financial commitment, payable over five years, to support the work of our diocese and our parish through the capital campaign. No gift is too small. Visit the campaign website to learn more: togethergoforth.org or pick up a pledge card by the church exits. Please contact Andy Lambros at (602) 867-9171 ext. 307 if you have further questions. Giving is a spiritual adventure. It is an act performed for God and with God. As we put this into perspective, we will know the joy that comes from making the decision to give. The building improvements that we are making to our church honor those who went before us and represent a special gift of ourselves and to future generations of St. Joan of Arc families. I realize that not every family is able to choose the same gift plan, but every family can be counted among our parish benefactors. What our Lord asks is not equal pledges but equal sacrifice. Even if you cannot make a financial pledge at this time, please support this campaign with your prayers. 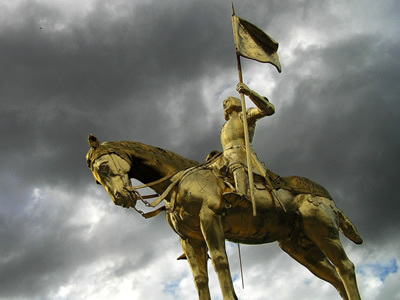 In the meantime, be assured that I pray at Mass everyday for all the families of St. Joan of Arc. Please join with me and pray Our Lady may wrap our parish in Her mantle of love and may we grow in our desire to help others encounter the living Christ. Thank you for making Saint Joan of Arc your home! The parish and preschool continue to thrive because of you and the grace of God.